All of the joints of the human, with the exception of the individual toes, were modeled. In this case, I chose to model one joint for all toes. The parts of the body are shown in Figure 1. With the exception of the head, eyes, and breasts, all parts of the body are based on modified cylinders. Each eye has 41 vertices, which are shown in Figure 2. Both eyes are modeled with the same eye drawn twice and translated, in order to save memory. The head has 328 vertices. The face is shown in Figure 3. The top, bottom, back, left and right sides of the head are shown in Figure 4. The back of the left and right ears are shown in Figure 5. I used the fewest possible number of vertices, so that the drawing procedure would be as fast as possible. If the actor is female, then breasts are drawn. The breast has 33 vertices, which are shown in Figure 6. As with the eyes, there is only one breast drawn twice and translated to represent both breasts. This will be changed in the future so that the torso will automatically include the vertices for the breasts. 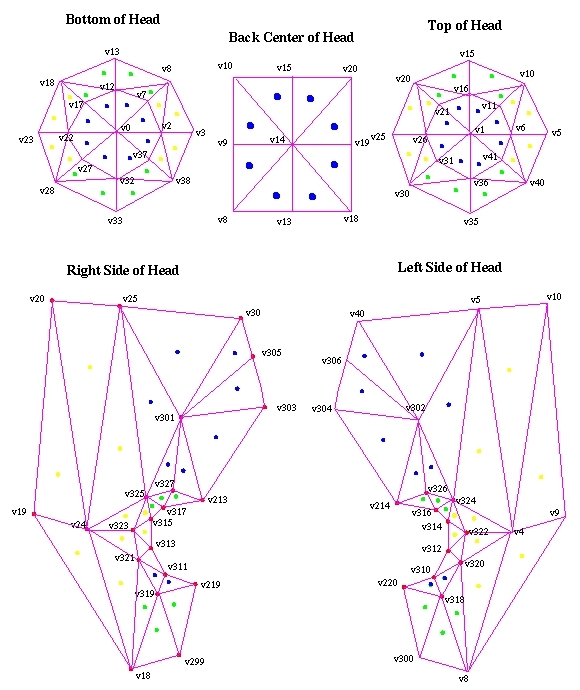 Each modified cylinder has 18 vertices, which are shown in Figure 7. Each modified cylinder has three parts: the bottom, middle, and top, which are shown in Figure 8. This was done so that the programmer could define different material properties for each. An offset from the part of the body to which it is attached is defined for each part. The torso is the deciding factor as to where the rest of the body is drawn. The neck, upper arms, and thighs are offset from the torso. As can be seen in the figure, the actor is modeled using a hierarchical approach. Figure 1 The parts of the body modeled for the actor. Figure 2 The layout of the eye (x+ is to the right, y+ is up, z+ is to the front). Figure 3 The front of the face. Figure 4 The top, bottom, back, left, and right sides of the head. Figure 5 The back of the left and right ears. Figure 6 The breast vertices. Figure 7 The layout of the modified cylinders. Figure 8 The parts of the modified cylinder.